Satsang is to recognise consciously our true nature. Nothing on this earth or on the heavenly realms can overwhelm or overcome you when you know who you truly are. Your true Self is perfect, complete and unchanging. And this discovery is the possibility and power, the availability and invitation of Satsang. Welcome to Satsang. Satsang, which means 'association with the highest Truth', has been taking place in one form or another for as long as people have been gathering together to inquire into their true nature. Whoever is searching for the Truth is engaged in Satsang—the root of the word may be Sanskrit, but the implication is universal. What you truly are is timeless and formless. We may call this Truth, the Self, unchanging Awareness—it is your true home, the source of love, joy and peace. In Satsang, this recognition is made possible. You are introduced to formless awareness—to God, to Truth—which is your very own source and light. 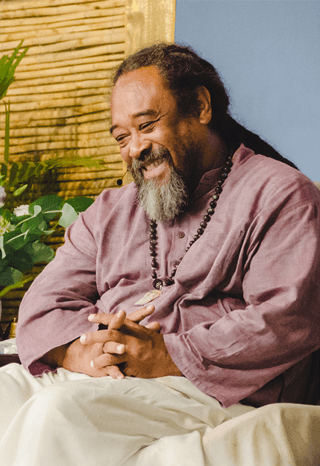 You are invited and guided to recognise that this pure consciousness itself is the source of all manifestation, and that without it, nothing exists. Through the gracious encounter, presence and guidance of a living master in Satsang, we directly experience this. Satsang can take many forms. It may be sitting in the presence of a master where seekers ask questions and receive guidance, or Satsang can take place by following the teachings offered in a video, audio recording or book. In fact, Satsang can even take the form of daily activities. Once you have the eyes and heart to see it, all of life is Satsang, calling you home to your limitless Being. In Satsang, the unreal gets emptied out. All the old tendencies thin away. The mind itself enters its source, and peace prevails. Remember, you are not creating a new Self. You are not going to ‘perfect’ the Self. The Self is already pure. It is already here—complete. This alone needs to be clearly seen. Satsang is the mirror in which Truth is recognised.